News of the resolution comes after weeks of frustration by Congressional investigators, who have repeatedly accused Rosenstein and the DOJ of "slow walking" documents related to their investigations. Lawmakers say they've been given the runaround - while Rosenstein and the rest of the DOJ have maintained that handing over vital documents would compromise ongoing investigations. Not even last week's heavily redacted release of the FBI's FISA surveillance application on former Trump campaign Carter Page was enough to dissuade the GOP lawmakers from their efforts to impeach Rosenstein. 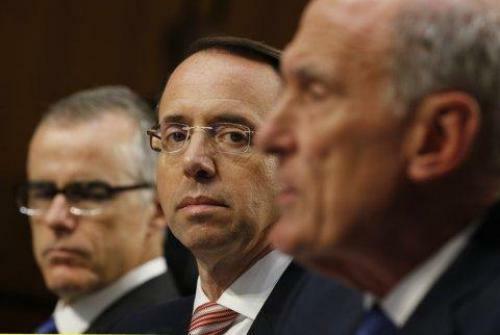 In fact, its release may have sealed Rosenstein's fate after it was revealed that the FISA application and subsequent renewals - at least one of which Rosenstein signed off on, relied heavily on the salacious and largely unproven Steele dossier. Congressional GOP were not impressed. And now, Rosenstein's fate is in the hands of Congress.